You may have noticed we’re giving more attention to the United States recently. We simply owe it to them for having so many modern stadiums. And while we cannot comprehend American football itself, let’s not allow our own shortcomings prevent us from doing the right thing and show you the stadiums that deserve to be shown. Three new additions from North Carolina coming today, more in due time. Please remember everyone is welcome to share photos of stadiums via email or flickr from any country, not just the US, and we’ll do our best to include your favourite stadia in StadiumDB. When it was opened in 1927, the stadium was literally sunken in pine woods. Two massive artificial slopes gave room to some 29,000 people, but with great care taken to preserve as much of existing forest as possible. And while today the University of North Carolina campus has consumed much of the trees, this same principle of preserving them is still applied to Kenan Stadium expansions in order to save its picturesque location. The two grandstand saw upper decks added in 1963, raising capacity to 48,000. In 1995-1998 the most important expansion to date was made, when first ever end zone grandstand was added (by then the stadium was last in its conference not to have any). That addition saw 8,000 bleacher places added in what is now called The Pit – student section with most vocal support. With west side closed, the stadium was horseshoe-shaped and waited for complete enclosing until 2011. This is where 2,980 premium seats were added in the east, all part of a 5-floor multi-use sports building. 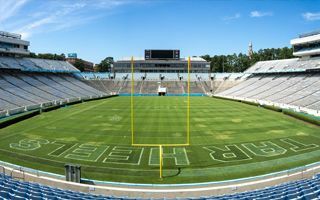 Name of the stadium celebrates the Kenan family, who had for decades contributed to the stadium, financing its initial construction and the expansion in 1963, among other. Support of them and other donors allowed the stadium to reach its current 63,000. And though sell-out crowds are nothing rare (in fact, all games between 1992 and 1999 were sold out), official record attendance stands at 62,000.